The fate of two worlds hangs in the balance. Capcom Producer Ryota Niitsuma makes true believers of us all. In well rehearsed style, Capcom are teasing out the cast of Marvel Vs Capcom 3 in a dramatic fashion that wouldn’t be out of place in Stan Lee’s own hallowed pages. We recently had the pleasure of dissecting an early build of the game with producer Ryota Niitsuma. Amongst the hyper combination brutality we managed to throw a berserker barrage of questions his way. Bear in mind that Capcom’s characters announcement policy is tighter than a Sentinel/Magneto/Storm team, so much as we may have liked, we had refrain from any “ZOMG! Phoenix Wright must be in it PLZ tell us now!!!! !” type urges. That doesn’t mean we didn’t manage to eliminate a certain a demon from the roster. In keeping with recent tradition we managed to fire off a couple of Darkstalkers questions which Niitsuma-san was more than happy to respond to. Victor von Doom -- He earned his doctorate dressing like a metallic goblin and beating up women. VideoGamesDaily: Marvel Vs Capcom 2 was more popular overseas than it was in Japan. 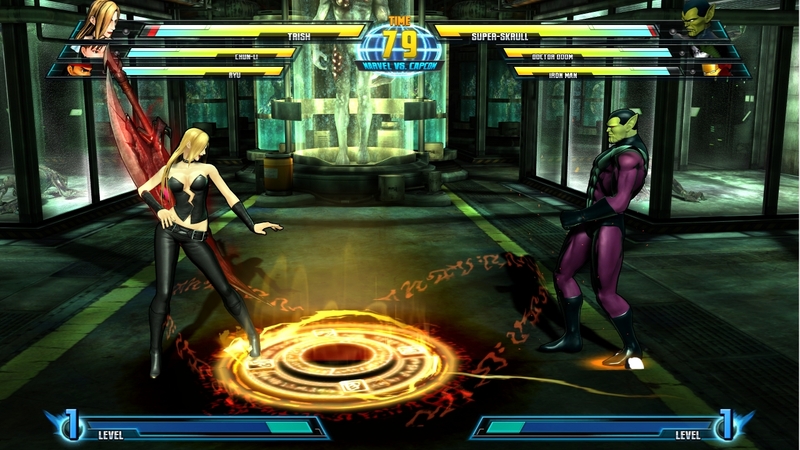 Has this affected the way you approach Marvel Vs Capcom 3? 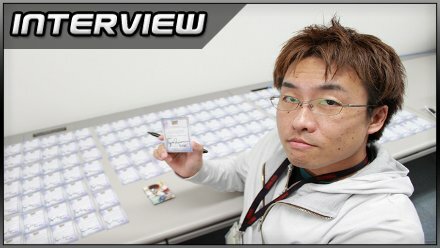 Ryota Niitsuma: It’s not that I focus on particular regions or anything, but it will happen to be that for Marvel Vs Capcom 3 the main market will be the US and Europe. Your last game. Tatsunoko Vs Capcom, was developed for arcades and MVC3 is being developed for console. Is there a big difference in the way you develop them? Fundamentally arcade and consumer markets differ in that arcade machines have two tiers of customers. First is the arcade operator that will have to buy the machine and then the end consumers who go and play and by paying in coins. With the console title you just buy the game so it gets to the end user straight away so the focus and how to market the games differ quite greatly. In a way making console games is a lot more focused because R&D only have to think about end consumers. Is the lack of location testing a problem with console games? By all means location test isn’t almighty so even when you carry out a location test you’re not going to get 100% feedback. When making consumer titles we do show them at events and we do pick up feedback from players. Okay, perhaps not as much as location tests but we still get feedback and make changes. Is there a pressure from Marvel or Capcom to include characters that feature in current or forthcoming films or games rather than obscure classic characters? Because we’ve got such a wonderful relationship with Marvel they’re not going to pressure us like that but we can see the subtle hints and they’re quite diplomatic about what they possibly would like us to implement so we buy into those ideas. 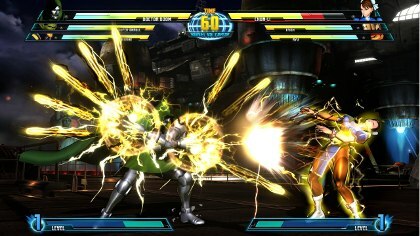 MVC3 uses many of TVC’s systems such as the three attacks buttons and the team aerial combos. How much did producing TVC help with MVC3? Did you use TVC to test ideas? Obviously the advantages that we identified in TVC we’ve extended and built on top of but because this isn’t a sequel to TVC but to MVC2 the focus is quite different, so although we’ve taken some things from TVC we have tried to build more on MVC2. The new Resident Evil stage is a Wesker's lab of bio hazardous monsters. Lickers and Hunters fill the cages while the Tyrant takes centre stage in the containment tank. Can you talk more about the button layout in MVC3? There are six buttons – light, medium, heavy, aerial, assist one and assist two. If you tap the assist buttons your characters will come in for a hit and if you hold the assist button you will switch characters. In MVC3 as a new a focus point we really wanted to concentrate on this aerial battle so we decided to implement a whole entire button just for aerial. Once you start the aerial you can choose what to do in the air, so you can either go further up or down, or you can just go sideways, but in going further up you can tag to another character and that character can again kick the enemy up, going up a few time for more damage so that’s one of the new strategies you can take on. 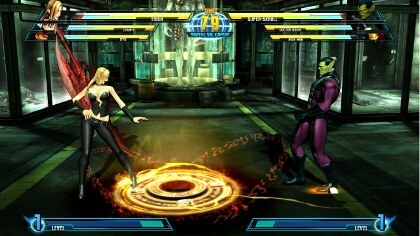 Obviously when the aerial kicks in it looks as if the combos just goes on and on and on, but the opponent receiving the aerial can stop that at particular points, so when a tag partner is about to connect if you input the same direction you can stop the combo and combo in return so you can read what you’re opponent is going to do. I am also thinking of lowering the entry barrier to the genre by allowing for some kind of easy command where you have a simple way of pulling off moves.It’s obviously not going to be as good as the standard mode, but if you don’t know anything it will allow you to pull of complicated moves with just one button. Will all characters be capable of the snap back move (forces an involuntary character swap) as standard or will it be limited to only certain characters as with TVC? Yes, that’s been accepted as an important system in MVC2 so we had to have it. Posted in Interviews, and tagged with Beat 'em up, Marvel Vs Capcom 3, Ryota Niitsuma, Street Fighter.